Different lots of the Special Reserve will be bottled, each with slight barrel-driven variations; the bottle reviewed here does not contain any lot information, however. 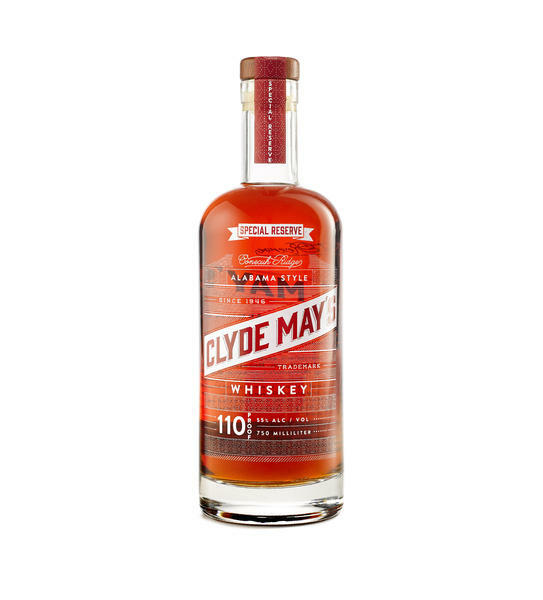 On the palate, Clyde May’s Special Reserve is a full-on fruit bomb, shotgunning the tongue with notes of clove-studded oranges, apple brown betty, and a sense at least of chopped almonds scattered atop toffee-covered brownies. The finish pushes big cinnamon character, more apple fruit, and a lot of warmth. (This is 110 proof whiskey, after all.) I don’t think it particularly needs water, but adding a bit smooths out the rough edges and makes the experience a bit creamier, though less flavorful. Add water literally by the drop, and only one at a time. Bottom line: Clyde May’s has taken what it learned from its freshman product and elevated it into a true American standout. Just slip a glass into the hand of any bourbon fanatic and see what they have to say. Now how do you like them apples? I missed the cloves, but you got it right. And I wouldn’t recommend even a drop of water. It’s perfect. I am a long-time corn whiskey drinker & former Tennessee Squire. Tried Clyde May’s yellow label and was impressed. Then my son gave me a bottle of 110. Oh my goodness! My new favorite whiskey. Really impressive, if you like bourbon-style sour-mash whiskey (with apple-enhancement), get a bottle today. You won’t regret it. Stiff AND smooth.